Many months ago, an email appeared in my inbox with the recipe Chocolate Chilli. I can’t remember where the email originated from (I had probably subscribed to something or other) but I believe the recipe was from the cookbook Well Fed: Paleo Recipes For People Who Love to Eat by Melissa Joulwan. 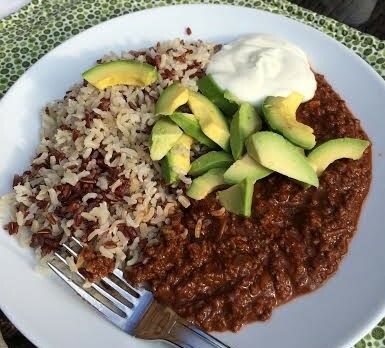 I had eaten a dish before combining chocolate and chilli whilst in Norway and had been very impressed and as both my husband and I love chilli, I set about making this version which immediately became our favourite chilli of all time. Heat a large, deep pot over medium-high heat then add the coconut oil. When the oil is melted, add the onions and stir with a wooden spoon and cook until translucent – about 7 or 8 minutes. Add the garlic and as soon as it is fragrant, about 30 seconds, crumble the minced beef into the pan, mixing with the spoon to combine. Cook the meat, stirring often, until it is no longer pink. In a small bowl, crush the oregano to release its flavour then add the chilli powder, cumin, cacao, allspice and salt. Combine with a fork then add to the pot stirring really firmly. Add tomato paste and stir until combined – about 2 minutes. Add the tomatoes with their juice, beef broth, and water. Stir well. Bring to the boil then reduce heat so that the chilli enjoys a gentle simmer. Simmer uncovered for at least two hours. Do not skimp on the simmer! Everyone likes to serve their chilli differently. We like ours with a mix of brown and red rice and accompanied by organic probiotic yoghurt and freshly sliced avocado drizzled with lemon juice. This recipe freezes well and I often make a double quantity so I have plenty in the freezer. Note #1: Most of the time I buy all my meat from the local butcher (he’s my son!!) but I was at the opposite end of the town one day in a department store and thought I would pick up a couple of packs of their minced beef to save myself a few minutes travelling. On that day, to my amazement they only had mince with a fat content of 10%. I do know that they sell mince with a 5% content but had none on the shelves. Basic mince at the larger local supermarkets has a staggering 20% fat content although they do sell packs with 10% and 5%, priced accordingly. I checked with my butcher who confirmed that his minced beef has a fat content of UNDER 5%. 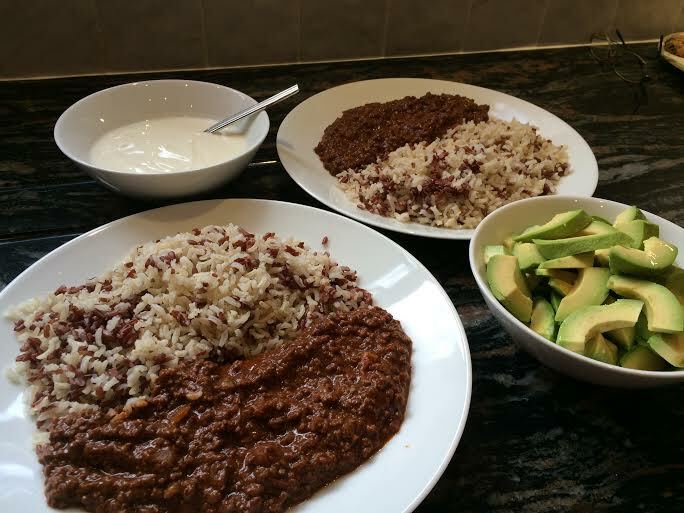 This entry was posted in Dinner and tagged Chilli, Chocolate, Cooking, Dinner, Healthy Eating, Minced Beef, Probiotic Yoghurt, Recipes. Bookmark the permalink.